The event registration cost is $4 per Girl Scout, no charge for family racers. Registration opened on December 1, 2018 (for Troop 1806 and invited troops), and closed on Wednesday, January 16, 2019. We set the close of registration prior to check-in so that all participant names can be entered into the racing computer before check-in. Registration fees are payable to Troop 1806. Registration is open to Troop 1806 Girl Scouts, their associated family racers, and to girls and family racers in local Girl Scout troops who have been invited by Troop 1806 to participate. 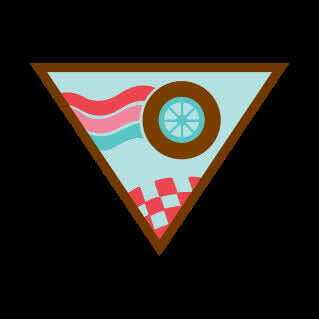 A family racer is defined as a non-Girl Scout family member associated with a Girl Scout who is registered for the Derby. So this could be a parent, sibling, uncle, aunt, etc. of a registered Girl Scout racer. The Girl Scout Derby is NOT an Area GS event, it is instead an invitation-only event of Troop 1806. Girls or family racers who want to use the official BSA kit for their cars can obtain them from the Boy Scout Shop in Raleigh, from scoutstuff.org, or from my office (3805 University Drive, Suite E) during regular business hours. The $4 cost of the car kits is over and above the $4 event registration cost. Optional Secure Check-In and fix weight, final touch-up. This is a good chance to avoid the Saturday AM registration and fix-it rush! What is a Girl Scout Derby? : Girl Scout Troop 1806 holds an annual Girl Scout Derby every January using a track and equipment provided by our friends in Cub Scout Pack 451. Girl Scouts and their family racers will have their own separate race in the morning, followed by the Cub Scouts and their family racers having their race in the afternoon..
Who can participate: The Girl Scout Derby is not a Council, area or service unit event. Instead, it is an invitational activity of Troop 1806. Trophies and Patches: The race is just for registered Girl Scouts, Daisy through Cadettes. The girls will race within their program level: Daisies will compete in a Daisy division, Brownies in a Brownie division, Juniors in a Junior division and Cadettes in a Cadette division. Provided we have the participation numbers, within each division, there will be trophies for first, second and third place in each of three categories: Fastest, Most Beautiful, Most Creative. So there will be nine available trophies for each program level. There will also be a Derby patch for EVERY GIRL who participates. The requirements for the badges can be found at the GSUSA Badge Explorer. Family Racing: There will be a family race, which is open to anyone associated with a registered Girl Scout who is racing - parents, siblings, leaders, etc. Family racers do not pay a registration fee, and do not receive a trophy or patch. They just race for fun, but winners for speed will be recognized. Judging/Choice of Trophy: The Fastest judging is done by a sophisticated computer program, using electronic sensors and based on the fastest speed of a car in four different heats. Judging for Most Beautiful and Most Creative is done by a special panel of judges prior to the start of the judging for Fastest. If a girl places in her division for Fastest, and also for one of the other categories, she will be given a choice of which trophy to accept - she doesn’t get two trophies. How to make the car: The race car does not have to be made out of an official kit, although the use of the official kits is recommended. The girls are encouraged to be creative, and to use whatever materials and designs they wish, either in place of the official kit, or supplementing the official kit. All cars have to meet the same size and weight requirements that the Cub Scouts do (see next), but how they get there is up to them. 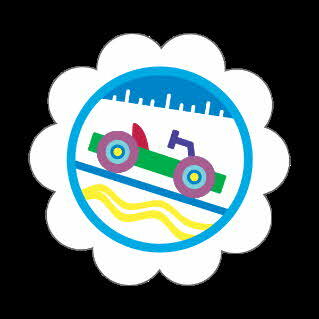 All cars must be able to roll freely on the track. Even cars competing for Most Beautiful or Most Creative must be able to get down the track and clear the finish line gate. Length: The total length of the car shall not exceed 7 Inches. Width: The overall width of cars (outside of wheel to outside of wheel. including axles and any protrusions on each side of the car) shall not exceed 3 inches. The minimum ground clearance for the car, and the distance between the wheels, must be sufficiently high and wide to allow the car wheels to run on either side of the raised track runner. This usually means a distance of about 1.5 inches between the wheels and a height of 3/8 inch. The weight of the car shall not exceed 5 ounces or 141.7 grams. There is no maximum height, but the cars must be able to get under the finish gate. This is about 10-12 inches. NO LOOSE MATERIALS of any kind are permitted inside or on the car - nothing that would fall onto the track. NO LIQUIDS of any kind are permitted - nothing that would leak onto the track. The car must be freewheeling and have no propulsion system other than gravity. There are to be NO starting devices, rockets, springs, rubber bands, propellers, etc. Only dry lubricants, such as graphite, may be used. Cars shall not ride on any type of springs.